Spiralizers. Hugely trendy right now. I recently got on the bandwagon myself. Being vegetarian I am not a stranger to using vegetables as substitutes for other foods, including pasta. 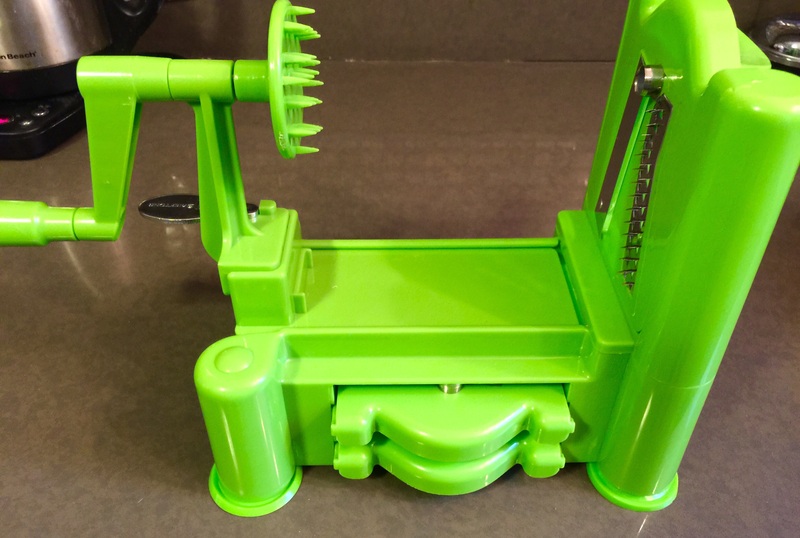 This handy little gadget makes it really easy to get beautiful, uniform sized cuts from all kinds of veggies. No more struggling with a knife and peeler! This is my inaugural spiralized recipe. It turned out pretty well, I think. It was fun to crank out the gorgeous noodles. The brown butter was the tricky part- I don’t think I let mine get quite brown enough, look below for some hints on this. Serves 2. Takes 30 minutes. 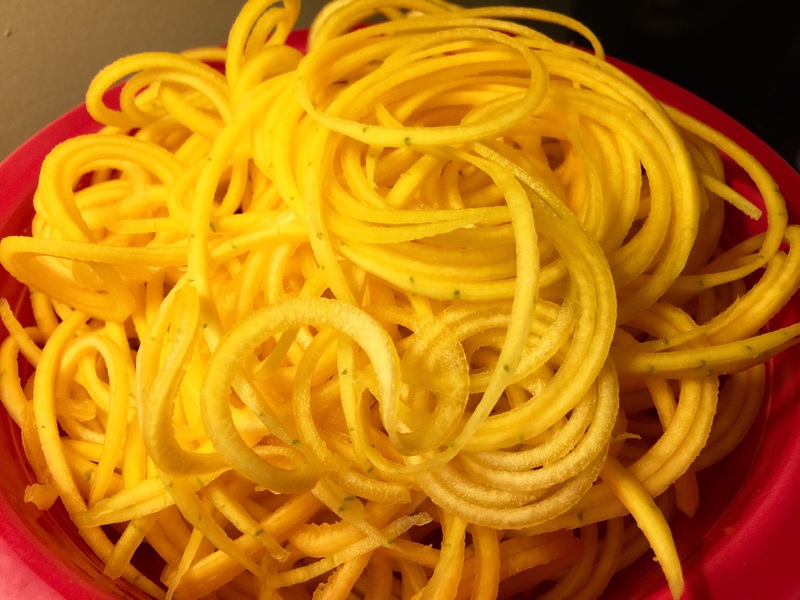 Set up you Spiralizer of choice. Preheat oven to 400 degrees. Peel you squash and discard the big bulbous bottom part that has seeds. 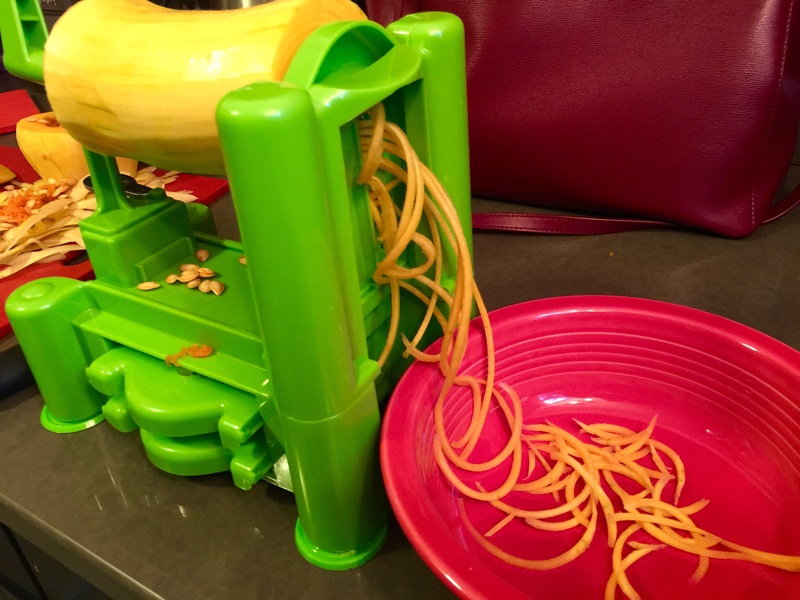 Place the long upper part into your Spiralizer and start cranking. 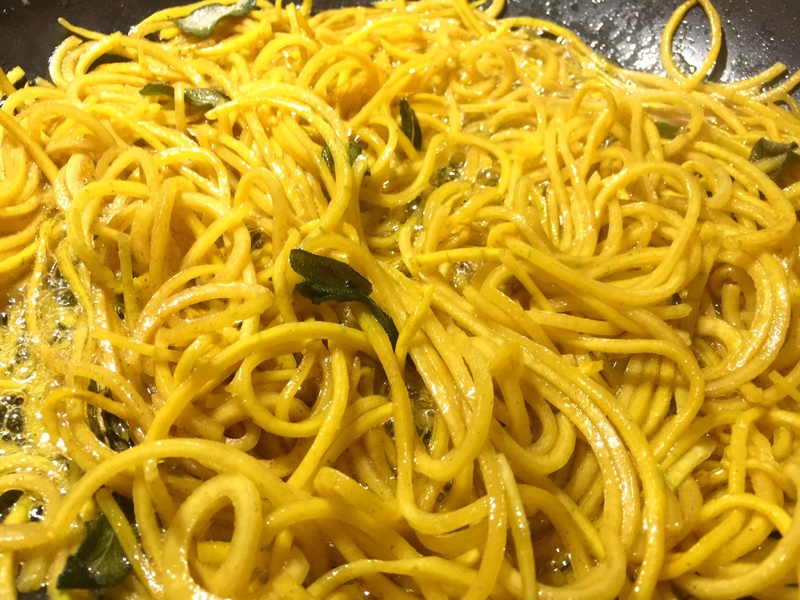 When your squoodles are done, place them on a baking sheet with parchment paper and toss lightly with olive oil. place into the oven to lightly roast for about 7-8 minutes. While they are in the oven, get your brown butter going. Use a light color pot, not a dark skillet so you can see the color of it while it cooks (I did not do this, a mistake on my part). Medium heat. The butter will melt and then star to bubble and foam. It will turn tan then brown. Some sediment will form in the pan. 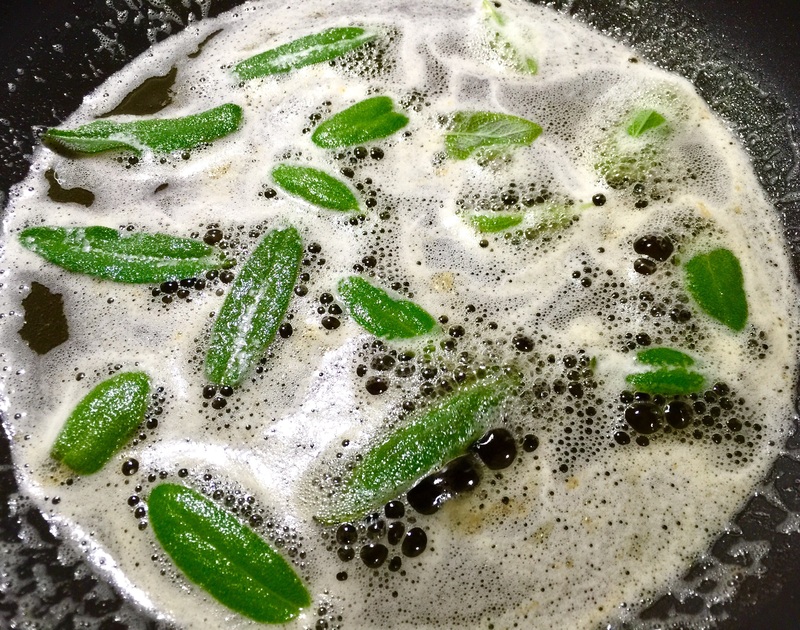 When it starts to tan, place your sage leaves in the butter. When it gets a nice golden brown color, it’s done. Take your squoodles from the oven and toss them in the sauce. Top with fresh pepper and Parmesan cheese. Tacos! 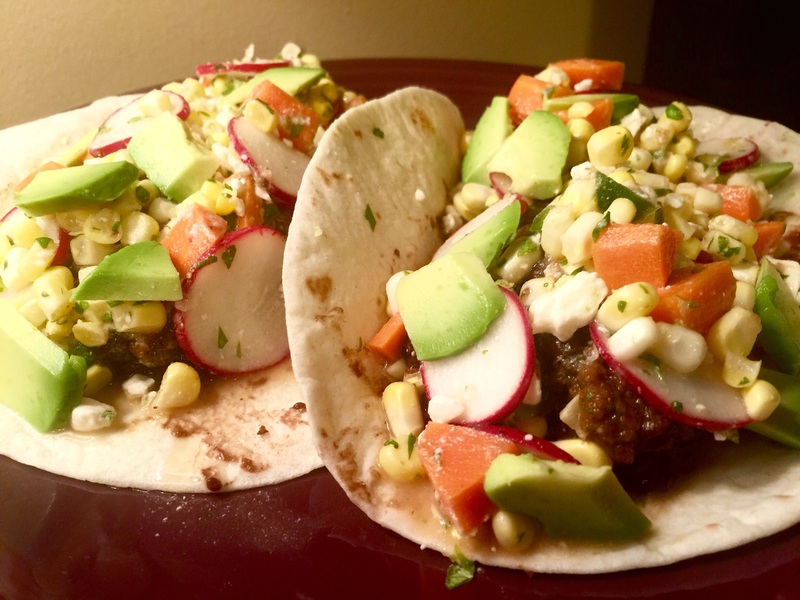 There are endless recipes and variations for tacos, which is what I love about them. 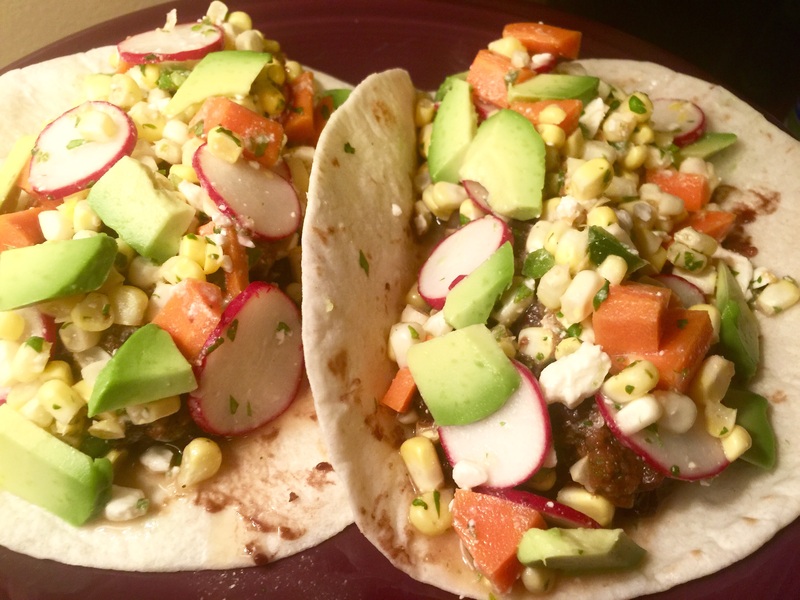 These tacos are made bright with the corn salsa, the corn right off the the cob. I layered it with a traditional tomato salsa and fresh avocado as well for a balanced bite. As you can see by the pictures these were pretty overstuffed, and I would up eating a lot with a fork. They would be great without the tortillas in a bowl as well with rice or quinoa, like any taco fixings. 1 whole bulb garlic, roasted. To roast garlic, chop off the bottom quarter. Leave in the peel. 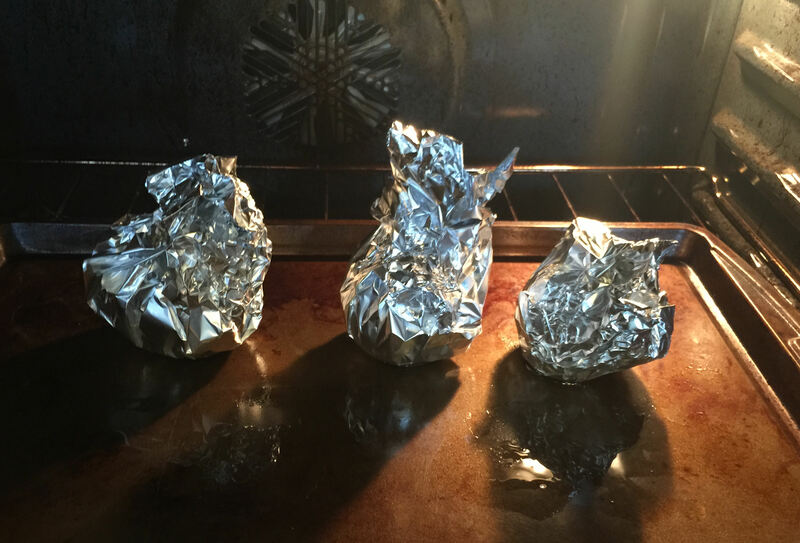 Cover in olive oil and place in foil wrap. Put in oven at 400 degrees for an hour. Garlic will be soft and light golden brown and easily pop out of its peel. 1 handful pickled carrots, diced. To pickle carrots: place 1/2 cup white vinegar and 1/2 cup Apple cider vinegar in pot with 1/2 cup water. Add a pinch salt, pinch of crushed red pepper, and several slices of fresh jalapeño to the pot. 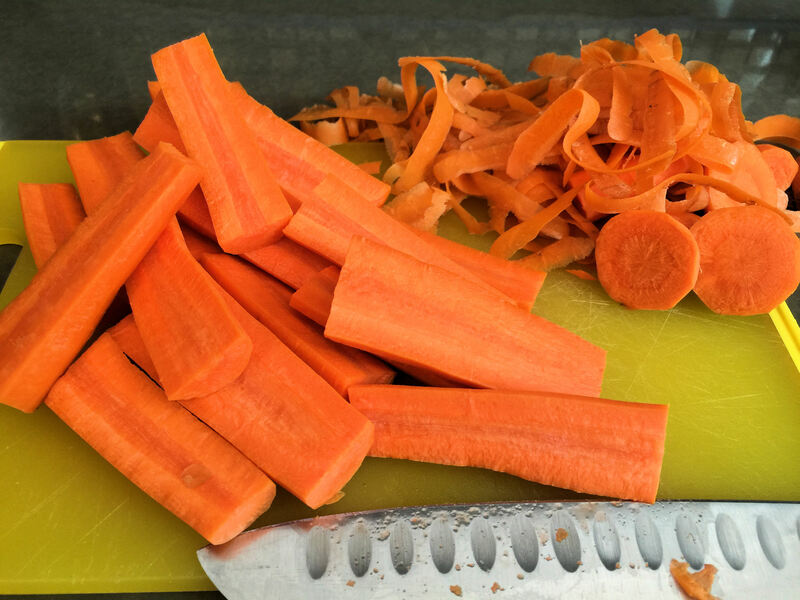 While coming to a boil, peel and chop up several carrots into inch size pieces. Place into pot, bring to boil then turn off heat. Let cool then jar. Place a sauté pan on the stove at medium heat with a tablespoon olive oil. When hot, add half the white onion to the pan. Cook until softened, about 5 minutes. Add minced garlic to the pan and cook another 1-2 minutes. Add the black beans with their juice to the pan. Season with about a teaspoon each: crushed red pepper, cumin, smoked paprika, and chipotle. Turn down heat to low and let simmer for about 20 minutes to cook off the bean liquid, stir occasionally. While the beans are cooking you can make the two salsas to go with the dish. 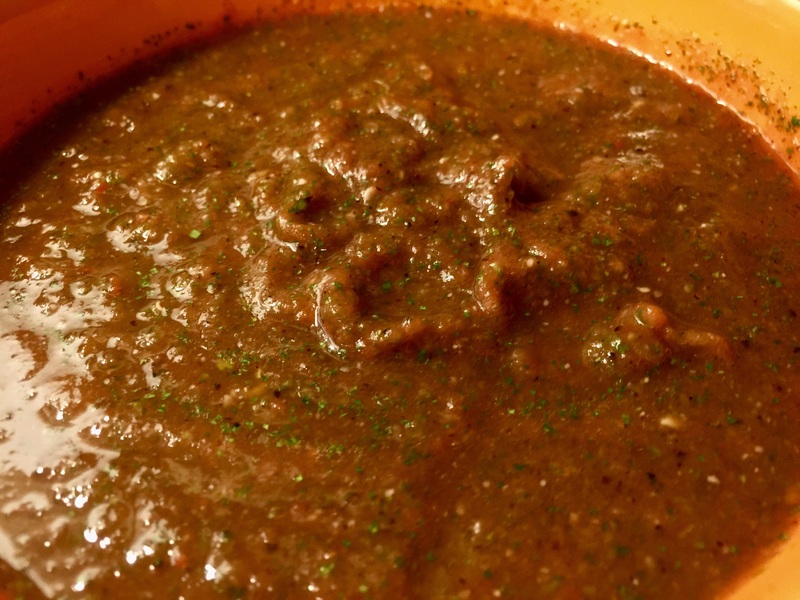 My favorite quick salsa comes from Thug Kitchen. It uses canned tomatoes, but you would never know, it tastes so fresh. The only part that takes any time is roasting the garlic, the rest comes together in a few minutes in the food processor. Add your roasted garlic, can of roasted tomatoes, half the white onion, a handful of the cilantro, the Serrano peppers, the green onion (if using), juice of one lime, 1 teaspoon salt, 1 teaspoon cumin, 1 tablespoon lemon juice and pulse together. For both this and the salsa below, I add a splash of lemon juice as I really love the brightness of lemons compared to limes. Or according to my brother, I just like Sprite and its lemon-lime goodness. You can use immediately and jar the rest. 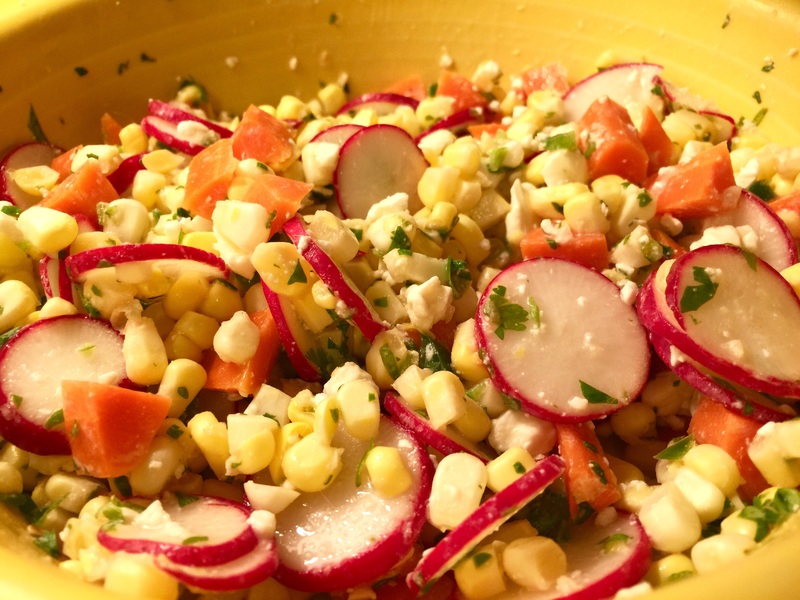 To make the corn salsa, place your fresh corn kernels in a bowl with the juice and zest of one lime, one tablespoon of lemon juice, one handful of minced cilantro, the feta cheese, the sliced radishes, the pickled carrots and add a teaspoon of salt. Mix together and set aside. This part of the recipe I found on Cookie and Kate. I added the pickled carrots for that extra punch of the vinegar. Time to assemble your tacos! Heating up your tortillas on a skillet will give them a little extra edge. Start with a scoop of the black beans then layer the two salsas on top. Finish it off with fresh avocado. One of the reason I like this taco recipe and similar ones to it, is because there is very little cheese. Just a little feta, which gives that nice salty punch. Cutting back on the cheese is good for us cheese-aholics! ** As stated above the roasted tomato salsa recipe is adapted from Thug Kitchen. I have a terrible mouth, so I love their hilarious recipes. 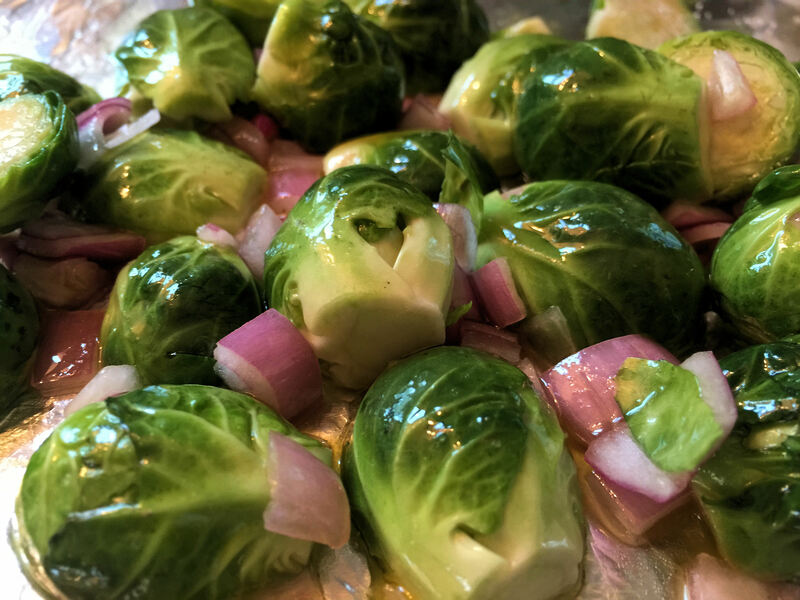 I’ve already pontificated on my love of beets this week, but brussel sprouts are as amazing. 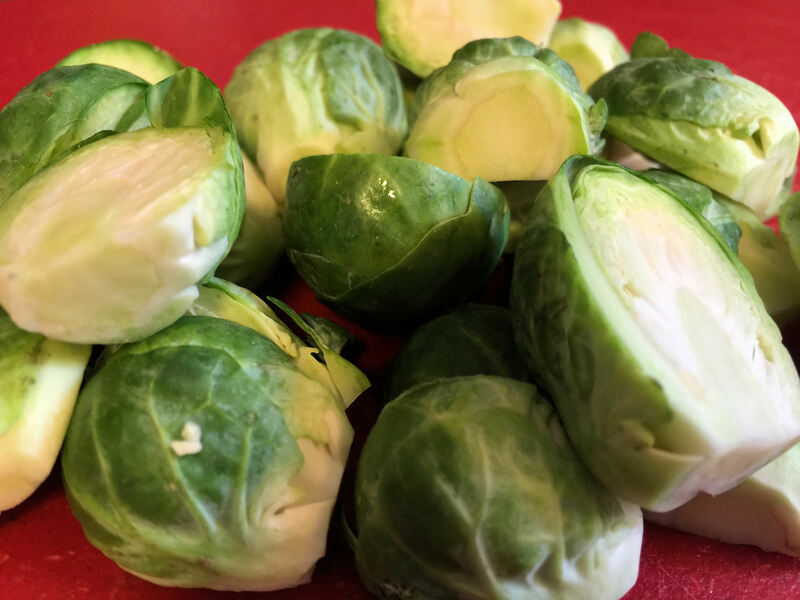 My favorite way to cook brussels is to roast them in olive oil and cider vinegar sprinkled with salt and then just eat a big bowl full by themselves. 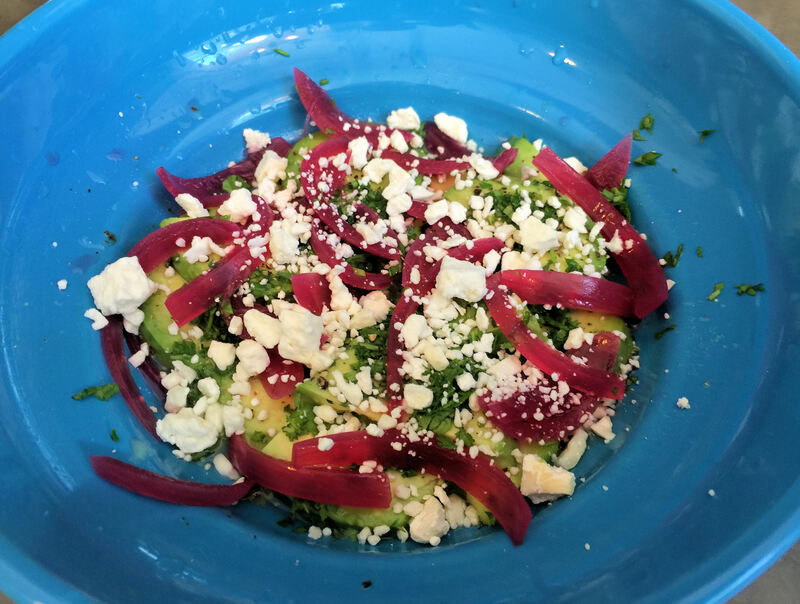 Recently I’ve been incorporating them into more dishes, and this super easy and delicious, nutritious salad is one of those, from Oh My Veggies. 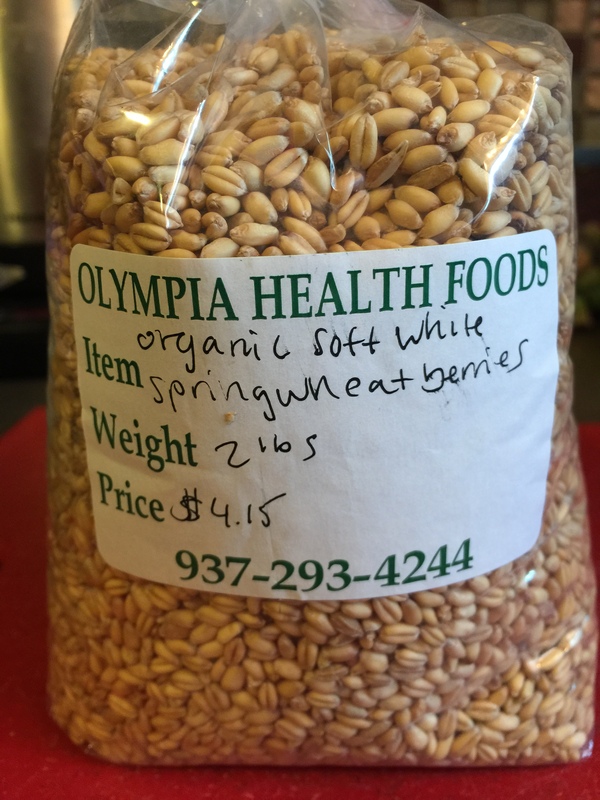 Wheat berries are a grain similar to farro and barley. They have a nice hearty taste to them and hold up well to a myriad of ingredients. You may not be able to find them at your regular grocer- so try a health food mart or specialty grocer or of course Amazon because they have everything in the world (I may have an online shopping addiction). Place veggie broth and water in a pot or skillet and bring to a boil with your wheat berries. Turn down heat to a simmer and cook for about 50 minutes, stirring occasionally. Prep your brussels and shallot. Spread on baking sheet with 2/3 of the olive oil, the apple cider vinegar, and salt. Place into oven and roast for 20 minutes. Then add walnuts and roast another 5 minutes. Whip up a quick dressing with a tablespoon of olive oil, the juice and zest of the lemon, the agave nectar the splash of red wine vinegar, and a pinch of salt and pepper. Drain the wheat berries. 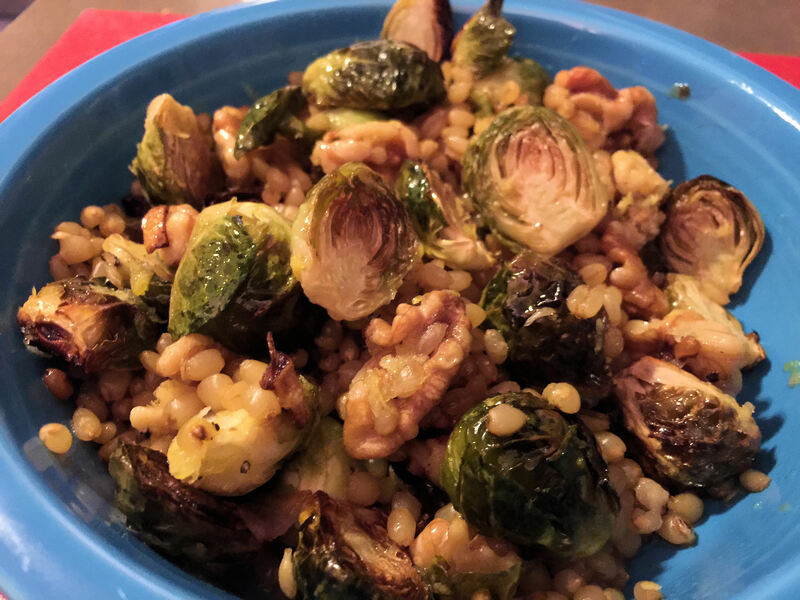 Place wheat berries and brussels mixture into bowl. Toss lightly with the dressing and bon appetite! What is it like living in pain everyday? I know something of pain myself from a bad injury followed by multiple surgeries. It is enveloping and all consuming to be constantly in pain. I am fortunate because my pain finally got better after several bad years- what if your pain never got better? That is a horrible reality many people are living in right now. The chronic pain population in this country is astronomical. Our offices, urgent cares, ERs, and hospitals are being overrun with patients whose pain is out of control. They want a solution to this pain, and end to it. But we cannot offer that. In so many cases we do not have a fix, we cannot make the pain go away. So we talk about managing the pain, and coping with it. But the problem is many are not coping- they are turning to pain management for higher and higher doses of opiates. When they can’t afford them they are buying pills off the street. When they realize how much pills cost they start buying heroin to replace them. They lose their jobs, they lose their houses, they lose their families, and many lose their lives. Does this happen to every patient with chronic pain? No, but we are seeing it more and more. The heroin epidemic is real and soaring. People of all ages, races and backgrounds are affected, and they are dying. Of overdoses, yes- but also of infections and severe medical complications of drug use. Lining the halls of our hospitals, they return again and again until the last time, when it is too late. How many young people in their twenties and teens will we see die of florid heart failure from endocarditis? The numbers keep climbing and what used to be rare is now common. How do we reverse this trend? How do we make the expectation that we very likely cannot rid you of pain, but slowly try and manage and reduce it? And do it all without any opiates? Well, it will take a seismic shift in culture. We are so wired to the mentality of “take a pill and make it better” or “we can operate and fix that” that patients expect this when they come to us. To have to tell patients that we don’t have any quick fix is frustrating not just for them but for us as providers. Getting a patient to accept as treatment physical therapy, exercise, cognitive behavioral therapy, medication for depression, tens units, injections, spinal stimulators, etc. when they really want something that will help right now in that moment- that is next to impossible. But it possible, and if we don’t change our culture this opioid addiction plague is going to become increasingly more wide-spread. Many pain clinic incorporate all those previously mentioned strategies, but most patients complain that they have to “get through” the counseling, therapy, and other treatments in order to get their pain pills. If those opiate pain pills were taken off the option list, since they have been proven again and again to have little to no efficacy in treating the vast majority of chronic pain problems, then all that effort could be shifted to optimizing the modalities that have been shown to have a positive effect. The demand for chronic pain management clinics and physicians is so high that we need more clinics where there multidisciplinary treatments can be given to patients. It takes months to get into pain clinics here in Ohio, and in the meantime most patients are getting by going to urgent cares and the ER to get short term pain pill prescriptions when they really need to be getting a jump start on PT, behavioral therapy, starting nutrition and exercise plans. Asking a primary care doc to deal with chronic pain is also a very difficult task- a patient will come in for a 15 minute visit with 5 chronic medical conditions that need addressed urgently but want to focus the whole visit each time on his chronic recurrent back pain. 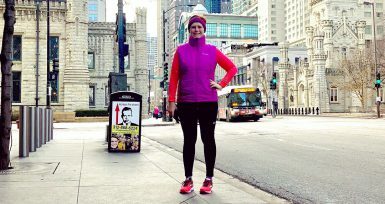 How can you keep a patient with morbid obesity, diabetes, and heart disease alive and going if you only get to treat their chronic pain issues every visit? In many cases, treating and improving chronic medical conditions (diabetes, obesity, depression) will also help improve and treat chronic pain, but again this is taking the long view and doesn’t offer any quick fixes for patients. Many primary care doctors will not prescribe any opiates at all, which is a good strategy, however these patients then come to the ER and many ultimately end up admitted due to “intractable pain.” On the inpatient side of treatment we are then in a daily struggle with patients who want IV pain medications, which are not the recommended treatment for chronic pain conditions, and who don’t want to be discharged from the hospital because their pain is no better than when they came in. Since I started medical school I have seen the problems and issues with chronic pain and opioids worsen ever year. It is creating a system in which more patients at more ages are on more long term pain medications. The consequences have been devastating to see and are continuing to accumulate. Reform is ongoing with more and more regulations over who can prescribe what narcotics. These regulations will help, but we have to keep working everyday stop the cycle of long term opiate prescribing. The more rigid we are, the more boundaries we set, and the harder we make it to access opiates the less prevalent they will be in our everyday society and medical practices. This salad is one of those dishes I make again and again. The recipe comes from Metropole restaurant in Cincinnati. It is easy to make, though it gets pretty smokey in the kitchen. If you happen to have a dog (or three) with a phobia of smoke alarms, take the battery out when you cook this one! 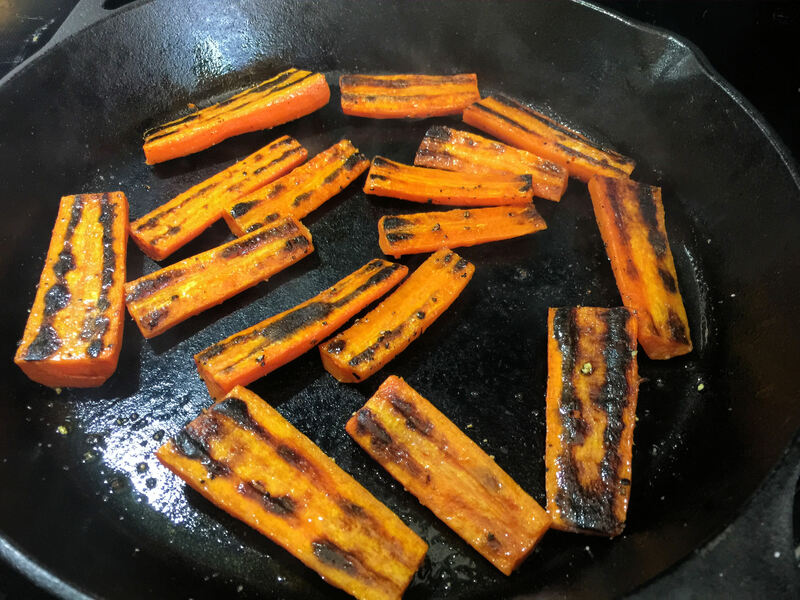 A good cast iron skillet is essential to get that good char on the carrots. 1 avocado- as firm as possible! 1 small handful pickled red onions. To pickle: take a red onion, slice thinly. In a pot on the stove add one cup cider vinegar, 1/2 cup water, 1 teaspoon salt, 1 pinch sugar, 1 pinch crushed red pepper. Bring to a boil with the onion in the pot, then turn off the heat and let cool. Place into a jar with the pickling liquid. Best used after 24 hours but can be used when cool. Place a pot of water on to boil (small). Peel four carrots and cut in half and then length-wise. Use large carrots for the best result. Cook the carrots until just able to be pierced by a fork. Drain and pat dry. 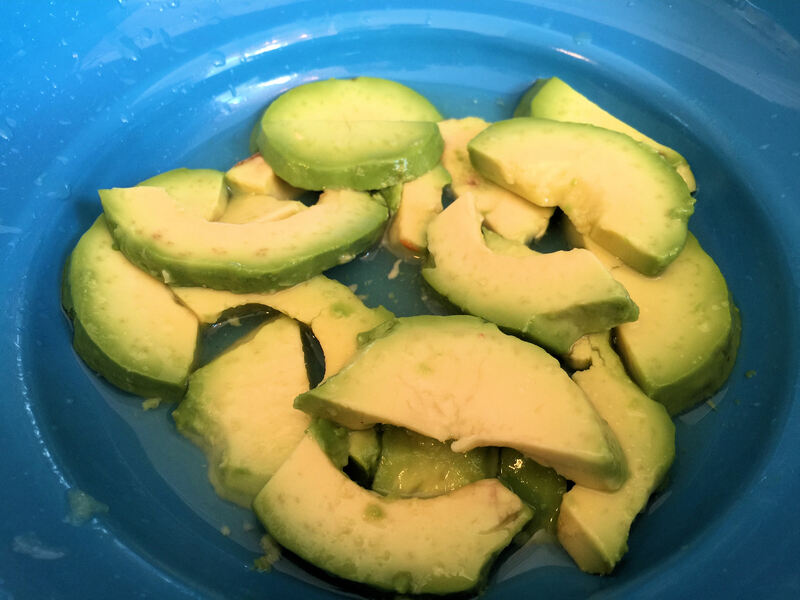 Slice your avocado and place into a large bowl. Squeeze juice of one lemon into the bowl. Add to the bowl a teaspoon of salt, pepper, the cilantro and parsley, the pickled onions, and feta cheese. Drizzle a splash of olive oil over the bowl and mix together. Heat your cast iron skillet with a thin coating of olive oil. When hot (just at its smoke point) add your carrots, flat side down into the pan. Have your vent on high as it’s going to get smokey! Cook about 5 minutes then flip. You want to literally burn them and see beautiful char markings. When done, take off the pan onto a paper towel to remove excess oil. 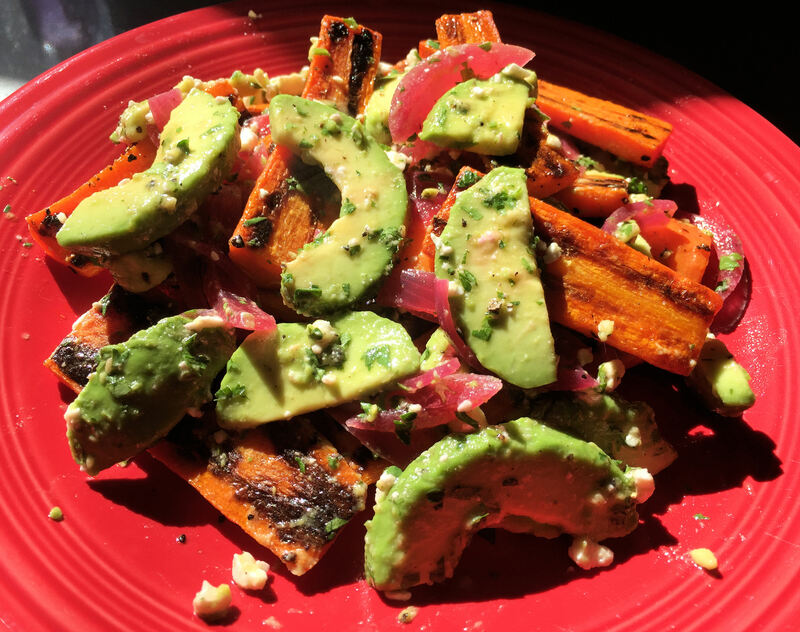 To plate, mix carrots and avocado bowl fixings together. A hospital is like a living, breathing organism, and the bigger it is the more people and parts are required to keep it together. One thing the recent debacle on The View has shown, is that none of us do our job in a vacuum. So when Joy Behar made her idiotic and condescending comments about Miss Colorado’s “doctor’s stethoscope” she had no idea she would be insulting not just nurses, but the millions of others of professionals who use stethoscopes everyday to do their job. #nursesunite and #showmeyourstethoscope have really shown remarkably well how much passion and dedication people have for this field. There are so many people who make it possible for me to do my job everyday, I wanted to take a little space here to lay them out and thank them. Environmental services. Not only do they keep our fancy hospital spotless but most of them are among the kindest people working in the hospital, and I am privileged to know them. Security. Who I know will come and protect me from screaming patients who are trying to assault me and the nurses and PCTs. Nutrition Services. Several of the gentleman who deliver food are so nice that many patients will ask after them when they are leaving the hospital. Lab techs. Helping to get all the vital tests patients need. Patient Care Techs. Unsung heroes. Helping patients eat, go to the bathroom, sit with elderly and combative patients, and many other jobs. They have very difficult jobs doing laborious work for not a lot of pay, they work very closely with patients and build up bonds with them, and they deserve a lot of credit. Hospital Unit Coordinator: a special category for them because they are really helpful on each unit and really friendly HUCs make your day better. Social Workers and Case Managers. Always put upon trying to get patients out of the hospital faster and faster. Having to deal with wretched insurance companies. Trying to help steer anxious and despondent families through the process of going to a nursing home- which is now routine and not the exception. We rely on them a great deal. Therapists: speech, PT, OT; helping our patients regain their functions, sometimes after completely devastating stroke or illness. Chaplain: this is an obvious need. We see much loss and sorrow in the hospital and we need all the support for families possible. Radiology techs: especially when we need important tests done really quickly on very sick patients- awesome. Nurses: the backbone of the hospital. Providing the one on one 24 hour care to patients. As physicians we may only physically round in a patient’s room for 5-10 minutes. We rely on our nurses to be our eyes and ears. Is the blood pressure dropping? Did they spike a fever? Have they urinated all day? Crucial information that the nurse will notice and relay to us. Is the patient breathing harder? What do their lungs sound like? The nurse will be the one at the bedside that moment to listen and tell me so we can make a plan together. Do we have a critically ill patient we know is going to die? In that case I will have come in, talked to the family, comforted them and the patient- but who is in the room when the patient’s heart stops beating? Not me, the nurse. She or he will call me and let me know, but they will be the ones with that patient and family in those final moments. Indispensable. Advanced practitioners: working alongside physicians in many different capacities to treat patients. Including PAs and NPs, there is a very broad range of skill sets and duties. And that leaves doctors. There are a lot of us in a lot of different specialties coming together to figure out solutions on really sick and complicated patients. Without all the other people above, though, we’d just be blowing a lot of hot air. I had never eaten a beet until maybe two years ago. Same with brussel sprouts. Oh, what I was missing all my life! I now eat both whenever I can. I have only recently taken to tackling the beet at home, but I needn’t have worried. 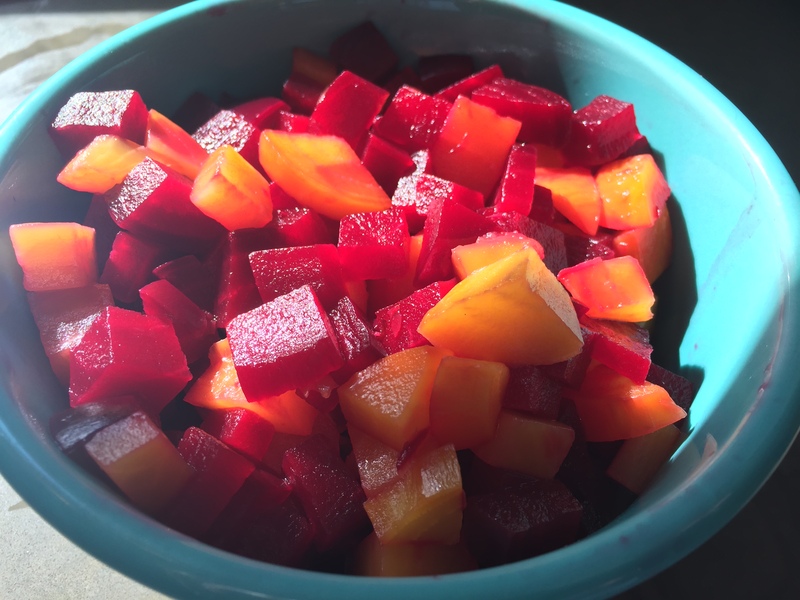 Roasting beets is just like roasting anything else- it is easy as pie. And the end result is so so so delicious! 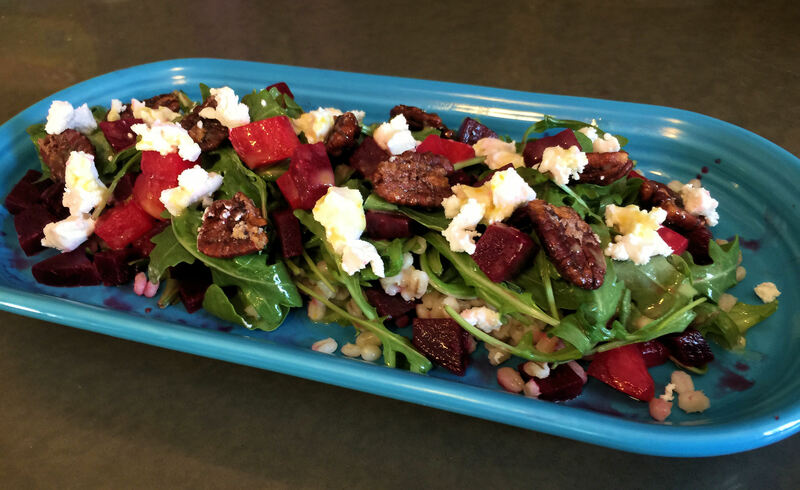 You can use the roasted beets for any recipe you like, or just eat them right out of the oven when they are cooled down. In this absolutely delightful salad, they shine alongside all the other ingredients. 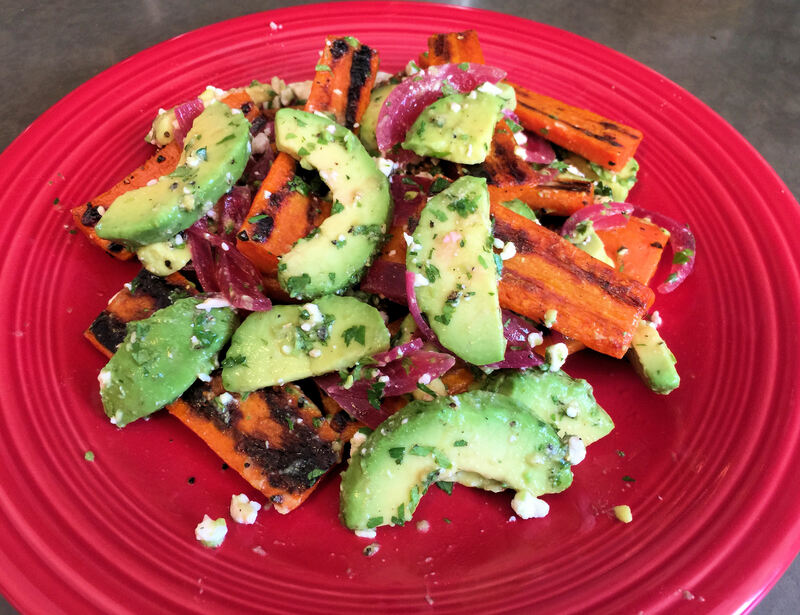 This salad is just a marvel of bright acidity, and I love it. I only slightly tweaked this one from the original recipe, which comes from The Grocery Cafe at Deer Valley Resort. Serves 4. 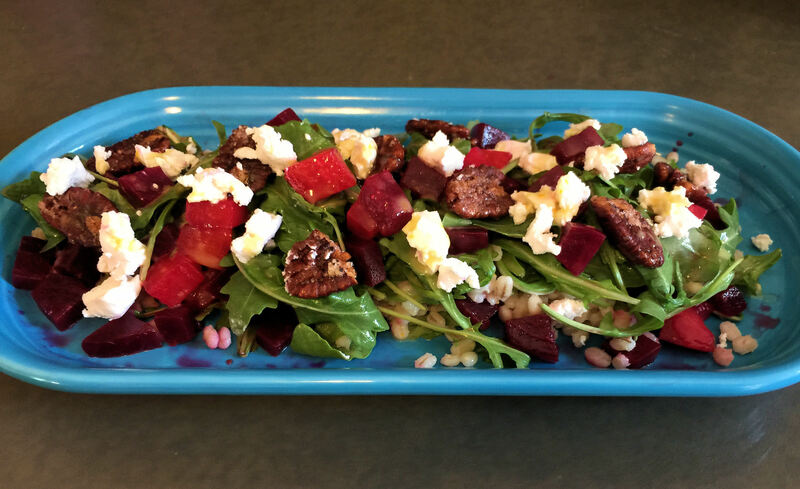 Takes 1 hour fifteen minutes (including roasting time on the beets). To roast the beets turn oven to 375 degrees. Start a pot of water boiling now as well for your grains. 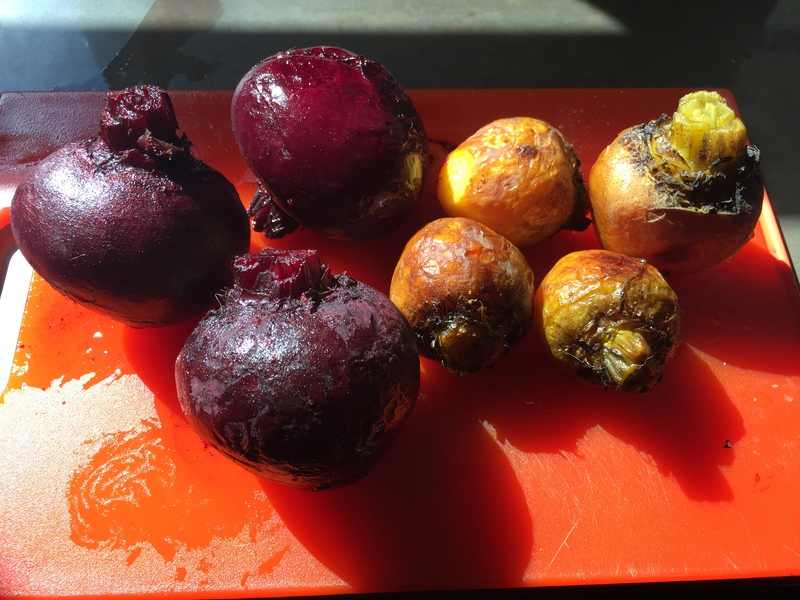 Place each trimmed and washed beet in a packet of tin foil with olive oil and salt. Place in the oven. 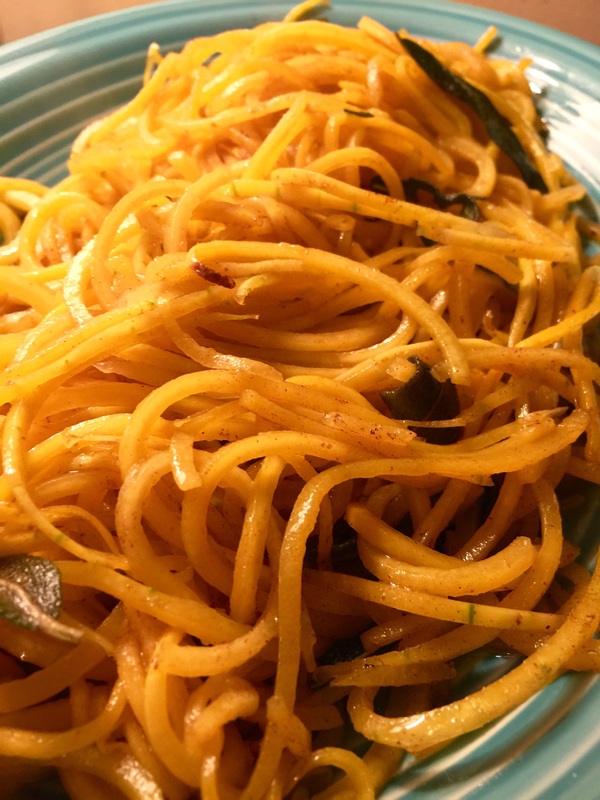 Leave about 45 minutes for smaller golden beets. 60 minutes for larger red beets. Cook your grains according to directions of what you are using. Barley takes quite a while to cook at least 30 minutes, so don’t forget to start it early. While the beets are roasting and your grain is cooking, you can continue with the other components, see below. When you remove your beets they will be soft and succulent. Let the beets cool. 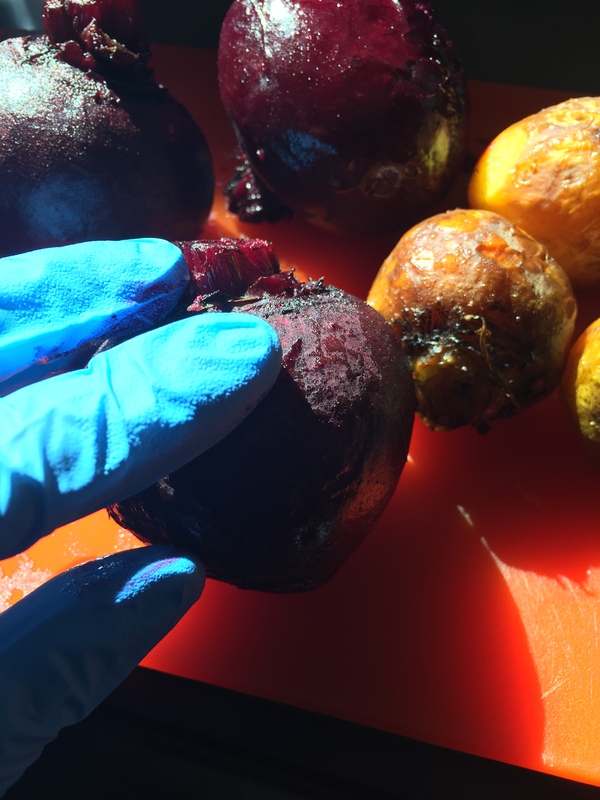 Then peel them- wear gloves or you will get beet juice all over you! Give them a uniform small dice and set aside in a bowl. Take pictures of them to show off to your friends, they are beautiful! 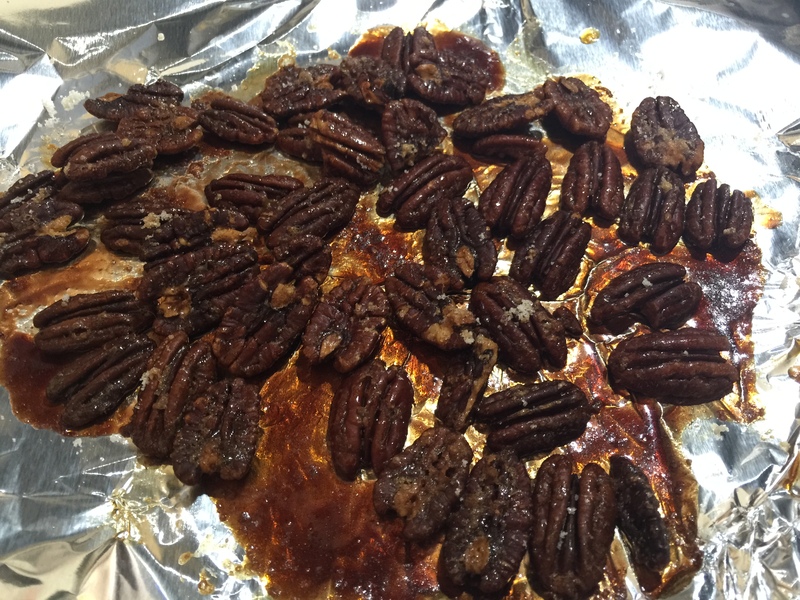 You can get your nuts candied in the oven at the same time your beets are roasting in there. Place them on a baking sheet, mix with the syrup and sugar and place into oven for about 20 minutes. While everything else is on the timer, do your vinaigrette. 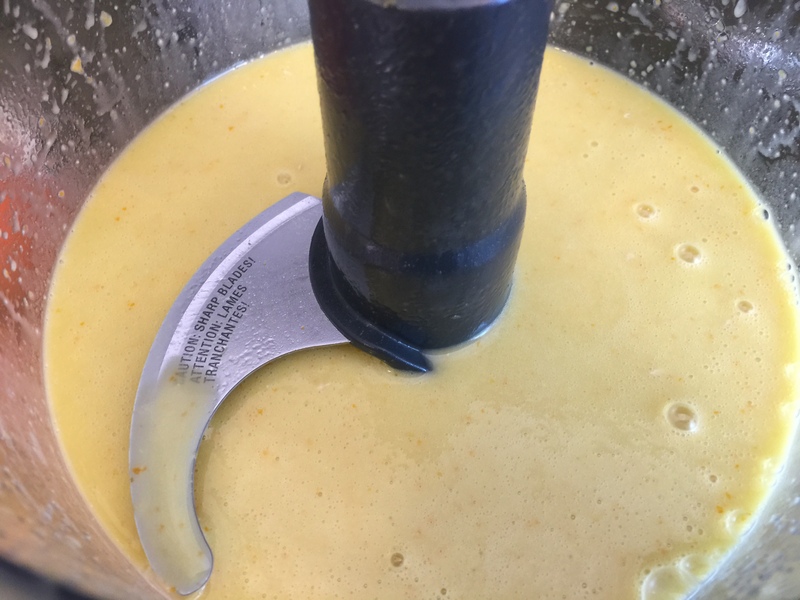 Place all components above into food processor and blend until smooth. Place into bottle and set into fridge. To plate: start with a bed of grains. Top with arugula, which has been lightly coated with the dressing. Next goes the beets, candied pecans, and goat cheese- crumble and evenly sprinkle over the salad. Give the top an even drizzle of vinaigrette, and mwah! So beautiful, lets look at it again. And it tastes even better! I put my extra beets, nuts, and barley into jars and tupperware so I can continue to eat them into the next week. Since I am the only vegetarian in my house, I am the only one eating this recipe, and I will eat it multiple times in the next few days. I look forward to it greatly, this has to be one of my top salads I’ve eaten.